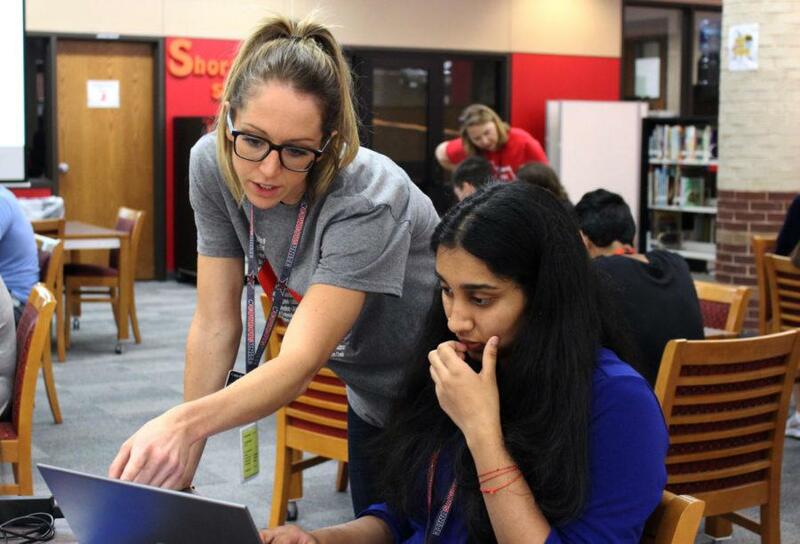 During 6th period, Coppell High School English III teacher M’Lynn Creighton helps a student find a book for Sustained Silent Reading (SSR) using the browser, Destiny, in the library. Creighton is a new teacher who recently moved from Pismo Beach, Calif.
After moving back from Pismo Beach, Calif. this summer, Coppell High School English III teacher M’Lynn Creighton has started her first year teaching at CHS. She is excited to start the school year and help her students become more confident with writing. Read more to find out why she decided to teach English, her favorite aspect of teaching English and more. How long have you been interested in English and teaching? 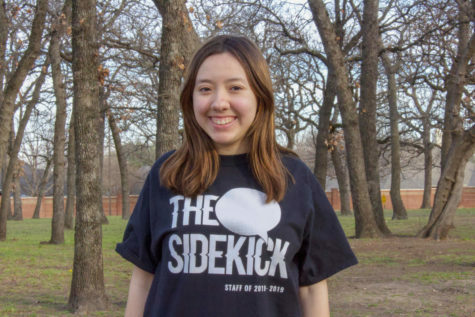 I’ve always been interested in English, especially reading and writing, but when it comes to teaching, I didn’t know I wanted to be a teacher until my sophomore year of college (the University of Texas at Austin). This will be my fourth year teaching. I was previously at Smithson Valley High School, which is in the San Antonio area. What first got you interested in English and being a teacher? It was definitely the fact that when I got to college, I didn’t feel like I was prepared for it. Once I was able to get my feet on the ground, I knew I wanted to go back to high school, make a difference and prepare my students. What is your favorite part of teaching English? I like seeing my students become better writers and being able to analyze the text. What aspects of Coppell High School intrigued you the most to make you decide to come here? Well, Coppell High School has a great reputation, and I just moved to the DFW area, so this was the first school on my list. How has your experience at CHS been so far? It’s been wonderful. All of the teachers in the English department have been extremely helpful, they’re willing to help me at any time of day and the students have been really sweet. How do you connect and build relationships with your students? I try to make them feel comfortable in my classroom. Right now, I’m working on sending them each a personal email on how I’m excited for the school year, and then they tell me about their interests. Any goals you have for this year? I’m always wanting to become a better teacher, so I want to develop those relationships with my students, I want to see them grow and I want to do a great job [as a teacher]. I just moved from California this summer. I was living there for two years for my significant other’s work in medical billing. I’m just really excited for the school year. Everybody’s been extremely welcoming, and I love my class and all the English teachers.